Topics: Gallery, Equipment List, Price List, Directions, Faq's, and Design By Bgraphic. 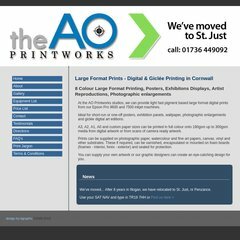 a0printworks.com A0 Printworks - Large Format Printing, Giclee Prints, Scanning and ..
a0printworks.com A0 Printworks - Large Format Printing, Giclee Prints, Scanning .. It is hosted by Uk2 Infrastructure (England, London,) using Microsoft-IIS/7 web server. ASP.NET is its coding language environment. ns1.interdns.co.uk, and ns2.interdns.co.uk are its DNS Nameservers. PING www. (83.170.124.2) 56(84) bytes of data.